Fundamenta Chymiae (1720). Trans. J. R. Partington, A History of Chemistry (1961), Vol. 2, 664. On consideration and by the advice of learned men, I thought it improper to unfold the secrets of the art (alchemy) to the vulgar, as few persons are capable of using its mysteries to advantage and without detriment. There are some, unversed in the skills of this science, who will tell you that one and the same term should be applied to all three instances of identical behavior. In article, 'The Self-Fulfilling Prophecy', The Antioch Review (Summer 1948), 8, No. 2, 195-196. Included as Chap. 7 of Social Theory and Social Structure (1949), 201. 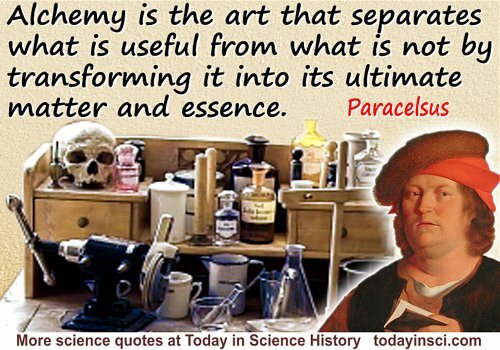 [Hermetic philosophy (Alchemy) was the only Art which might be able] to complete and bring to light not only medicine but also a universal Philosophy. …quaeque sola non Medicinam tantum, sed et universam Philosophiam valde perficere et illustrare possit. Original Latin in The Theological Works of Isaac Barrow (1859), 46. Translation, with citation, in B.J.T. 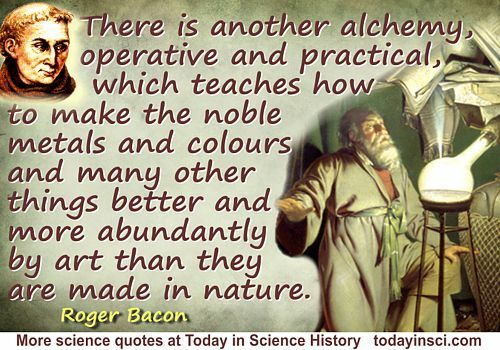 Dobbs, The Foundations of Newton's Alchemy (1983), 96.